MOSCOW, August 21./ITAR-TASS/. Moscow asked the UN Security Council to adopt a statement calling for ceasefire in south-eastern Ukraine for the duration of the humanitarian mission there, the Foreign Ministry said on Thursday. “We are urging the sides involved in the conflict to announce a ceasefire for the duration of this mission and asking the UN Security Council to adopt a relevant statement,” the ministry said. “We expect all members of the international community to support further efforts to alleviate the humanitarian situation in south-eastern regions of Ukraine,” the ministry said. Moscow on Thursday warned against possible provocations to upset the delivery of humanitarian aid to south-eastern regions of Ukraine, the Foreign Ministry said. 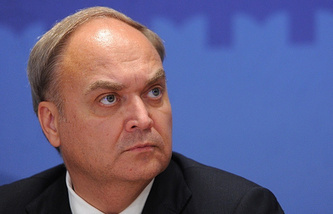 Moscow welcomed “the final agreement on all parameters of the urgent delivery of the Russian humanitarian aid to the south-east of Ukraine by the Izvarino-Lugansk route”, the ministry said. 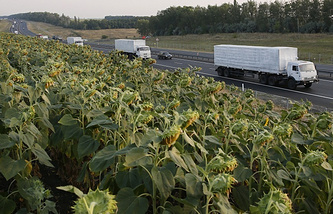 On August 12, about 270 trucks with almost 2,000 tonnes of relief supplies left the Moscow region, heading for the Ukrainian border. It arrived in the southern Rostov region bordering Ukraine on August 14 and has been there since then. Ukraine and Russia have agreed the procedure for examining and customs clearing the cargo: each truck will be accompanied by a Red Cross official, and Russian and Ukrainian customs officers will examine and seal the trucks before they cross the border.